In addition to the launch of their Hawaii GPU in early Q4 2013, AMD would also unleash their latest Kaveri APU for the desktop FM2+ platform in late Q4 2013. AMD’s Kaveri APUs would feature the latest core architecture along with enhanced GCN graphics on a single die package. 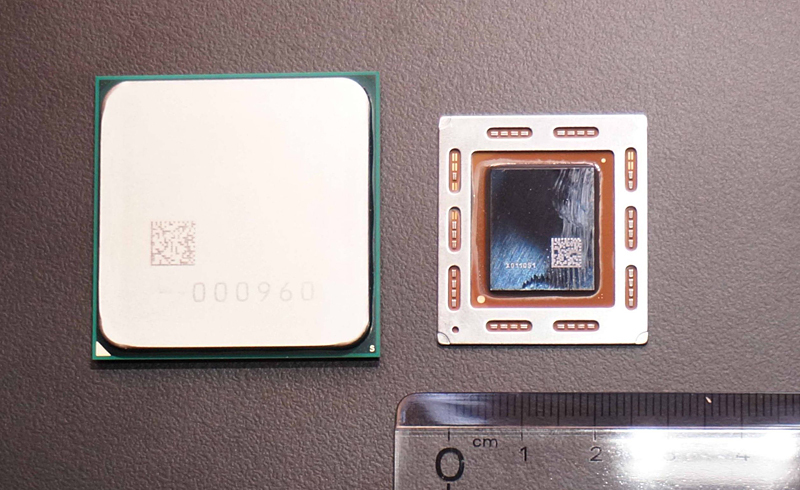 AMD Kaveri APU for the desktop platform would arrive first in Q4 2013 followed by the mobile variants in Q1 2014. The new APU would feature the x86 Steamroller cores and the revised GCN graphics powering AMD’s latest Volcanic Islands discrete graphic cards. In addition to the core architectural changes, the Kaveri APUs would also support AMD’s HUMA (Heterogeneous Unified Memory Architecture) to enable a coherent memory access path to both CPU and GPU part of the APU. A few months back, we looked at the Berlin APU which is the same APU as Kaveri built for the server market. From the Berlin APU specifications, we came to know that the next generation APUs may feature upto 512 Stream processors which is the same number we get on the discrete Radeon HD 7750. A recent founding by Planet3DNow reveals that the top Kaveri APU parts won’t be restricted to only 512 Stream processors and can feature upto 832 Stream processors. Entries of a 100W Kaveri APU called (KV Spectre Desktop 100W 1305) were spotted on Sisoft Sandra’s benchmark portal along with some specifications regarding the GPU, memory and a few bandwidth tests. The Kaveri APU model showed a total of 13 CUs which amount to 832 Stream processors that is just a CU less than the top HD 7700 series card – Radeon HD 7790 and higher than the Radeon HD 7750 and Radeon HD 7770 (10 CUs/ 640 SPs) which could hint at the performance. The GCN enabled graphics goes by the name of Radeon R5 M200 which was also revealed in the leaked catalyst drivers a while ago and uses a naming scheme which the next generation discrete GPUs from AMD would be using (AMD R-200 Series). Following images are courtesy of Planet3DNow! If Kaveri APU for desktop do come with a high stream processor count, than that would mean that consumers would be able to easily rejoice superior gaming performance on a low price platform such as the FM2+ itself. Expect AMD’s Kaveri launch by the end of this year, FM2+ socket based motherboard for the new APUs including older Richland and Trinity based APUs can already be found on a few large retailers.